Dubuque, Iowa: NASCAR Dodge Weekly Series action on a tacky high banked 3/8 mile clay track at the Dubuque County Fairgrounds Speedway provided the fans with a fast paced racing program that saw the final checkered flag of the night wave at 9 p.m. on Sunday night. Scoring his second consecutive NASCAR Late Model feature win was Jeff Aikey from Cedar Falls, Iowa driving his #77 GRT/AEM Engines Late Model. Aikey was the third different driver to lead in the 25 lap feature. Jeff Tharp led the first 10 laps before Darren Mish was able to get by. Mish led until lap number 18 when Aikey powered by on the top side of the track. Aikey went on to score the win over Mish and Bobby Hansen. Dan Shelliam and Luke Merfeld rounded out the top five. 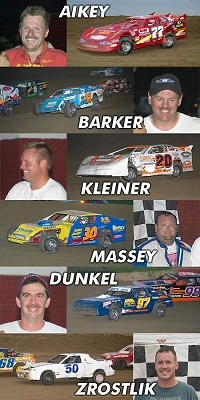 The Dubuque Speedway �Modified Master�, Ron Barker scored another impressive feature win on Sunday night. Barker caught race leader Mel Saffran on lap number 10 and went on to lead the final ten laps of the flag to flag caution free race. Saffran settled for second ahead of Scott Nesteby and Mike Burbridge. Ty Kleiner returned to victory lane on Sunday night, scoring the win in the 15 lap Pro Stock feature. Kleiner was able to get to the front quickly and move on to a comfortable win. Jeff Kennedy ran second ahead of Jeff Valentine. Mark Massey scored yet another feature win in the growing B-Modified class. Massey took the lead from Scott Schurbon and went on to record the ten lap feature win. Schurbon crossed under the checkers in second ahead of Jay Garvey. Rob Petsche led the first 4 laps of the NASCAR Hobby Stock feature before Steve Dunkel was able to move out front. Dunkel raced on to victory taking the feature win over Jason Rauen and B.J. Schmitt. Steve Stackis appeared to be on his way to the Farley Flyer feature win but he came up just short as Joe Zrostlik was able to overtake Stackis on the white flag lap and score the win. Stackis finished a close second to Zrostlik, John Flury took third ahead of Rick Hammer. The next two events at the Dubuque County Fairgrounds Speedway will be NASCAR Dodge Weekly Series events hosted by the Dubuque County Fair. Wednesday, July 23rd and Sunday, July 27th will be the dates with both events scheduled for 7 p.m.